If you sign up for the Uncommonly Chocolate newsletter, we do ask you for your first name and your email address. That information remains secure and private. We will never share, trade or in any way disclose that information to anyone else. Nor will we use your email address for any other reason than to send out the newsletter. I am a member of at least one affiliate program; this means if you click on a link from one of my emails or website and buy the product or service, I receive a commission at no cost to you. It's not much, but it help me pay for hosting, web platform, and admin fees to keep this site running. Get this 10-pg. 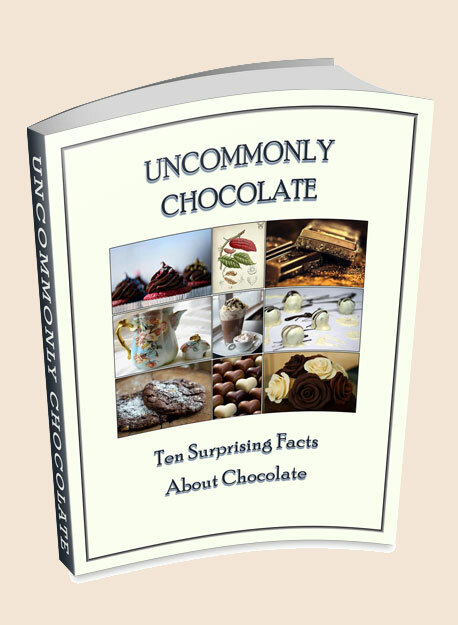 booklet FREE when you sign up for Uncommonly Chocolate's monthly "Chocolate Chips." 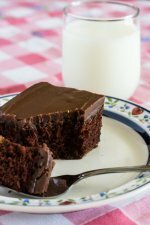 I’ve spent a lifetime looking for the perfect chocolate cake – cocoa flavored, moist, dense yet tender, with a true fudge icing. Who knew it was right under my nose all along? 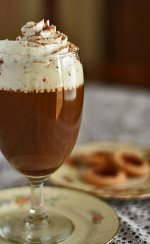 Hot chocolate drinks are a natural choice for cold weather. Alcoholic or not, they are sure to keep you warm on frosty evenings. Here are a few to get you started. Santa Fe is known for its climate and art galleries. Now come discover Santa Fe chocolates. Chocolate elixirs are a specialty, but how about chocolate covered chile peppers? Bourbon Chocolate Pecan Pie gives a new twist to an old favorite. It turns a deadly sweet dessert into a rich treat fit for royalty. In my perpetual quest to find the perfect chocolate mousse, I've discovered it's all about the air bubbles. For rich, fresh roasted flavor, you can't go wrong with A Hill of Beans coffees, both flavored and straight roasts. 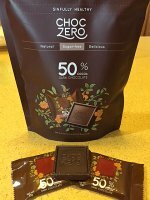 Discover the wonderful taste of sugar-free chocolate that even diabetics can eat. It’s low carb and teeth-friendly, and it's even high in fiber.